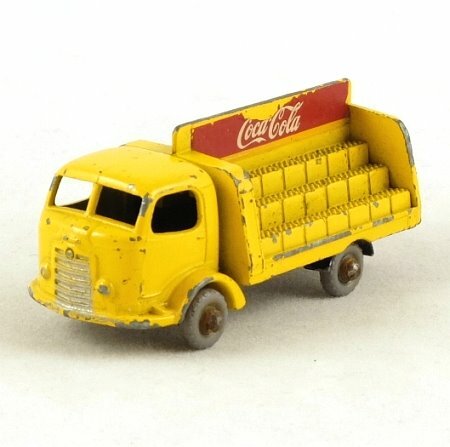 This is the second version of the Matchbox Coca Cola lorry, with a black plate chassis incorporating the rear mudguards. In yellow with grey plastic wheels on rounded axles. With 'Coca Cola' decals on sides and rear, and silver trim to the grille. This model is in fair-to-good condition, with chipping around the edge of the load area. The rear decal is very good, but both of the side decals have a bit missing from the top edge. There is some rust on the axles.